“Every time a building is completed and occupied here it helps change how people see Buffalo, and how they feel about our downtown,” said Matt Enstice, born and raised in Buffalo, New York, and chief executive of the Buffalo Niagara Medical Campus. BUFFALO – In 2002, when he was recruited to help turn 120 acres of this city’s underperforming downtown into a jobs-producing, world-class campus for medical research, education, and clinical care, Matt Enstice was among a select few of the city’s young professionals who was convinced the idea wasn’t a joke. Mr Enstice knows jokes. Prior to returning home and becoming the president and chief executive of the Buffalo Niagara Medical Campus, Inc., the non-profit group overseeing the development, Mr. Enstice spent five years in New York in the late 1990s helping Lorne Michaels produce Saturday Night Live. On a bright summer morning, Mr. Enstice bounds across a medical campus that has huffed and growled with construction for a decade, and never more intently than this year. Work just started on a $100 million, 287,000-square-foot medical office building. Two blocks away excavators prepare the site of the $243 million, 410,000-square-foot Women and Children’s Hospital. In the fall, construction starts on two more buildings: the $375 million, 500,000-square-foot State University of New York at Buffalo School of Medicine and Biomedical Sciences; and the $40 million, 142,000-square foot Roswell Park Cancer Institute. The four buildings, which total 1.34 million square feet and a $758 million investment, are scheduled to be completed over the next three years. By any measure, the numbers are impressive. They also match the goals initially envisioned by former Mayor Anthony Masiello, who is credited with coming up with the concept of leveraging a medical research and education campus as an economic development strategy. After Mr. Masiello left office in late December 2005, his successor, Mayor Byron W. Brown, who’s completing his second term, directed his economic development aides to support the project with city funds, fast-track permitting, and strategic business and professional recruitment. Brendan R. Mehaffy, the executive director of the Mayor’s Office of Strategic Planning, said the Buffalo Niagara campus is building the city’s credibility as a center of innovation, and influencing the construction of new hotels, luxury residential development, and retail construction. Home prices in the neighborhoods closest to the medical campus have climbed 15 percent in the last two years, according to the city’s latest real estate figures. The New York Times today published my article on Buffalo, the latest in a series of dispatches I’ve reported in the Times on recovering Rust Belt cities. Other cities reported in the series include Cleveland, Toledo, Grand Rapids, Akron, Cincinnati, Louisville, and Owensboro and are available in the Rustbelt Revives section of ModeShift. This article on ModeShift is a longer version of the Times article. Almost half of the total is generated by the Medical Campus. A decade ago, the big parcel bordered east to west by Main Street and Michigan Avenue, and north-south by North and Goodell streets, was a smattering of shuttered brick warehouses and manufacturing buildings, weed-scattered surface parking lots, and deteriorated turn of the 20th century housing. The 20-square-blocks, in short, fit right in to the rest of Buffalo. In 2006, the campus’s first new building — the $24 million, 73,000-square-foot Hauptman-Woodward Research Institute for structural biology – was finished. In 2012, three more projects were completed: a $291 million, 475,000 square-foot, 10-story, research and clinical care building that houses the Gates Vascular Institute and the State University of New York at Buffalo’s Clinical and Translational Research Center; the $64 million, 202,000-square-foot, 300-bed HighPointe on Michigan skilled nursing center; and a $37 million, 2,000-space parking deck. The Medical Campus now employs 12,000 people and is one of Buffalo’s densest zones of professional employment, according to city records. By 2017, following completion of the next phase of development, said Mr. Enstice, 17,000 people will work at the campus. “Every time a building is completed and occupied here it helps change how people see Buffalo, and how they feel about our downtown,” he said. It’s been a very long time since people felt anything about Buffalo’s downtown other than dismay. The city, which dates to a frontier outpost in 1789, opened a 125-year period of industrial expansion and population growth that started in 1825 with the completion of the Erie Canal. The 40-foot wide, four-foot deep channel linked the Hudson River with Lake Erie and made Buffalo a hub of manufacturing and commodities transport. 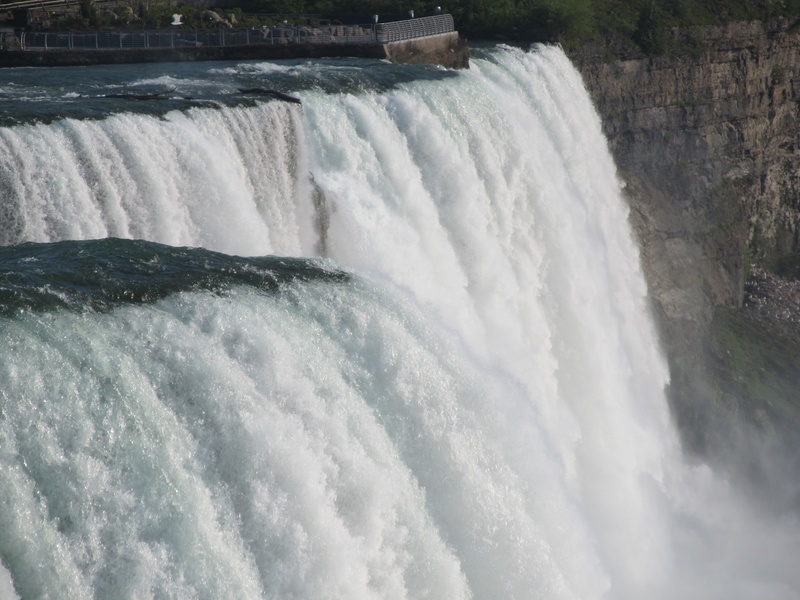 The city’s economy, and the development of thriving arts and cultural institutions, was considerably strengthened after engineers opened the world’s first hydroelectric power plant at nearby Niagara Falls in 1895. By 1950 Buffalo was home to 580,000 residents, its peak population. Buffalo is still New York state’s second largest city, with just under 260,000 residents, according to the U.S. Census Bureau. The last decades of the 20th century, though, were marred by the same trends that swamped other Rust Belt cities — disinvestment, job loss, population migration to the suburbs, high vacancy rates in office and residential real estate, and stubbornly high rates of poverty. City leaders and residents understood what they were witnessing and weren’t afraid to take big steps to reverse the decline. 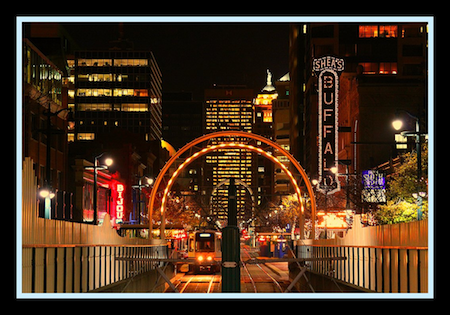 In 1985, for instance, Buffalo completed the nation’s second light rail transit line, a $535 million, 6.4-mile, 15-station rail connection that runs between the city’s harbor and Buffalo Sabres sports stadium, and the south campus of SUNY at Buffalo. The last 1.2 miles of the transit line run above ground to serve the city’s Main Street pedestrian mall, which banned car and truck traffic after it opened in 1986. Both projects were designed to retain businesses and residents, and encourage new real estate investment. But in a city that was losing an average of 5,300 residents a year, neither the mall nor the transit line performed as expected. The city is now rebuilding Main Street to restore vehicular traffic. By the early years of the 21st century Buffalo’s elected leaders and economic development specialists joined their Rust Belt city colleagues in understanding civic well-being wasn’t necessarily tied to big projects built episodically. Instead, places like Pittsburgh, Akron, Cincinnati, and Louisville were discovering that smaller projects built in bunches were attracting jobs and residents, and activating their downtowns. The Buffalo Niagara Medical Campus embraced that strategy. Though in aggregate it’s a mega development, in reality it’s a collection of smaller projects built in a clump. Another example of the strategy is Buffalo’s Larkin District, named for a soap manufacturer that owned and managed a 600,000-square-foot manufacturing and warehouse building in the city’s southeast. Howard A. Zemsky, who spent much of his career as an executive with Russer Foods, one of the country’s largest processors of delicatessen meats, before he became a prominent developer here, bought the building in 2002 and converted it to commercial office space. Since then he’s purchased and renovated four more buildings nearby, one of which serves as headquarters for First Niagara Bank. Mr. Zemsky, the principal of Larkin Development Group, also built Larkin Square, a collection of restaurants and covered outdoor seating areas and event stages at the intersection of Swan and Seneca streets that has quickly become one of the city’s popular gathering places. The total investment: 685,000 square feet and $50 million, he said. Mr. Zemsky’s work attracted the attention of Governor Andrew M. Cuomo, who appointed him co-chairman of the Western New York Regional Economic Development Council, one of nine such regional groups advising the state on public investments for job and business growth. In large part because of the development momentum Buffalo had attained at the Medical Campus, Larkin Square, and in other sections of the city, Governor Cuomo last year committed $1 billion in tax incentives and grants for Buffalo’s development, spending that is being proposed and supervised by the council that Mr. Zemsky co-chairs with Satish K. Tripathi, president of the University at Buffalo. The first investment under the “Billion for Buffalo” program is a grant to spend $15 million to build a new 40,000 square foot laboratory at the medical campus, and $35 million more to equip it for high-tech companies, among them the Albany Molecular Research Institute, a contract pharmaceutical and biotechnology research and manufacturing company that Mr. Enstice helped to recruit. And that is no joke. Buffalo . Maybe in the summer time ? Love it !